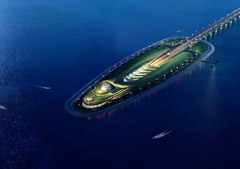 Through its link in Zhuhai, the HZMB will connect with three major expressways, namely the Jing-Zhu Expressway, Guang-Zhu West Expressway and Jiang-Zhu Expressway, and then to the Mainland’s fast expanding road network. Therefore, major cities in the West Bank of Pearl River Delta like Guangzhou, Zhongshan, Jiangmen, etc can be reached easily. With the extensive connectivity with the Mainland’s road network, the HZMB Main Bridge is anticipated to attract traffic thus resulting in substantial return in economic benefits and making it viable to construct. 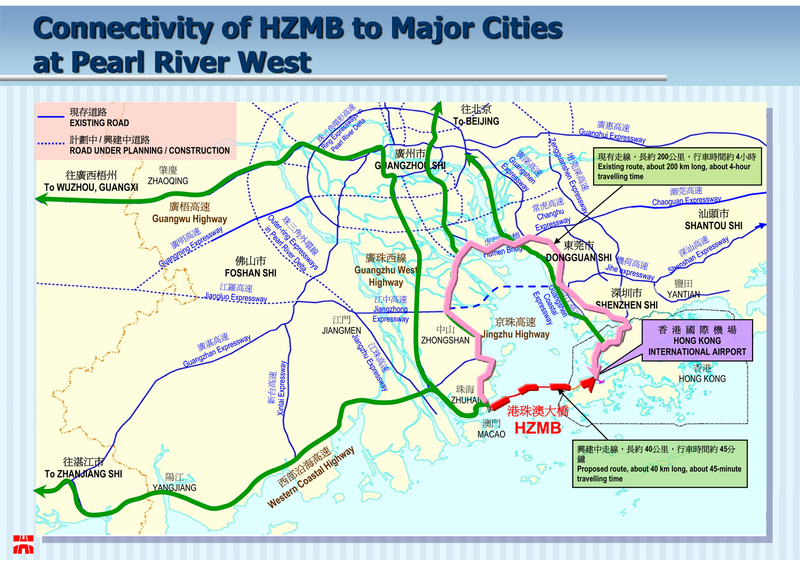 Upon completion, the HZMB will shorten the distance of Hong Kong with most areas of the Western PRD to within a reachable 3-hour commuting radius, bringing Hong Kong to the doorstep of the major industrial and commercial cities in the Mainland. Moreover, the HZMB would enhance the attractiveness of the Western PRD to foreign investment and Hong Kong’s position as a trade and logistics hub.